FORMER Papua New Guinea Hunters utility Kato Ottio has made the Canberra Raiders squad for their trial match against the Newcastle Knights on Saturday at Wade Park, Orange, New South Wales. The lanky Central and Bougainvillean man was included in coach Ricky Stuart’s 27-man squad. Ottio was given his first chance in the lime-green of Canberra at the Auckland Nines earlier this month and performed well, scoring a try and setting one up against the St George Illawarra Dragons, convincing Stuart that he was ready to be used in a trial match two weeks before their first NRL fixture on March 5 against the Penrith Panthers. The 21-year-old has signed a contract with the Raiders to be part of their NSW Cup side, the Mounties, in 2016 but he will be available for call up to first-grade if required —injuries and suspensions, as well as representative call-ups could pave the way for Ottio to make his debut in the NRL. The hard-running centre-back-rower could find himself on the wing for the trial, however his size (192cm, 106kg) makes him adaptable to several positions in the backline and forwards. 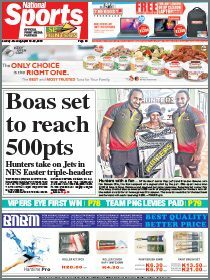 It has been nothing short of a meteoric rise for the former national volleyball representative, who only started playing rugby league exclusively in 2014. Ottio was part of the national side that won the volleyball gold medal, beating Pacific champions Wallis and Futuna at the Mini Pacific Games in Wallis and Futuna in 2013. He made the transition from rugby union, the code he was playing along with volleyball, to rugby league with the help of former Kumul Josiah Abavu, who got him to play for Maopa Paio in the 2014 Southern Nines. Ottio then went on to play for the Dobo Warriors in the Port Moresby Rugby League that year and made the POMRFL squad for the Southern Zone trials in Sogeri and then made the Southern Zone side to the National Zone Championships in Lae later that year. 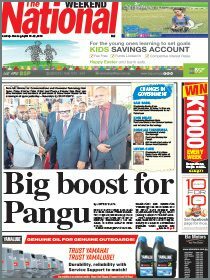 His performance at the Zone Championships was enough to convince selectors they had a special talent on their hands and Ottio was named in the National Zone All Stars to play Digicel Cup All Stars as the curtain-raiser to the Prime Ministers’ XIII clash — he ended up being used off the bench by the PNG PM’s XIII as well. Kumuls coach Mal Meninga noticed Ottio and advised PNG Hunters coach Michael Marum to include him in his squad for the 2015 season.